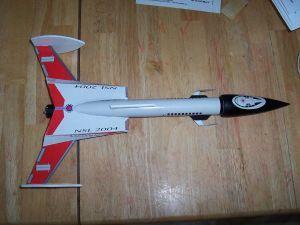 This is a single staged sport rocket with an unusual design. It is classified as a skill level 3. The components came in a hanging bag-style package with insert art. My particular model was production #45. It contained two sheets of balsa, a single body tube, balsa nose cone w/ eye screw, launch lug, a toothpick for the guns, engine mount hardware (tube, hook, 2 centering rings), and a cutting guide (since you have to cut out your own balsa pieces). The recovery system consist of a plastic chute, a short length of elastic, and some Kevlar® thread. From the balsa, you cut out two fins, two fin tips, two aft bulkheads, 4 gun rails, and 2 gun supports. There is plenty of wood, but you must be sure to use the correct thickness for each piece. The construction is anything but normal. The instructions are very clear in most cases, so I will only hit on the unusual or unclear aspects. First, your motor mount must extend from the body tube .75". Push it in too far, and you're out of luck. Also, if you are using a kit that has a body wrap like the NSL wraps, be sure to align the wrap with the hook assembly. This will be important later. The next unusual part is the construction of the fin/bulkhead assemblies. I found the sanding instruction unclear, but if you look at the cover art and look at where the shroud will attach to the bulkhead, you will see what part needs to be sanded with a slight bevel. When gluing the fins to the bulkheads, wax paper proved invaluable. Finally, I found that when I followed the instructions exactly regarding the placement of the fin between the bulkheads, I ended up with a gap between the bulkheads when placed in their final position, due to the dihedral-like alignment. The wrap covered the gap, and I only need to apply a little white paint to the wood exposed on the sides. Not a big deal but something that should be considered. Building the shroud was pretty straightforward. Take your time with the forward edge and you should be able to get a nice, sharp point. Attachment to the body tube goes EXACTLY like the instructions, so follow them to a T.
Finally, when assembling the lug standoff, I found the only major issue I had with this kit. The launch lug included was too short to create the bevel cut specified. I simply substituted a launch lug from my parts box, but if I didn't have one, this would have been a problem. Wraps are great. However, I found properly aligning of the body wrap was very difficult, so I ended up covering a 1/32" spiral misalignment at the top of the tube with monokote. Be prepared to deal with this, because that was the best I could do after three tries. I only hand-painted exposed wood on the fin assemblies and the gun mounts. The nose cone also requires spray-painting and I selected black. This brings be to a minor issue: the nose cone had a two-step shoulder (see parts picture), however, the cover art shows a smooth nose cone and the instructions do not address this. I chose to use Elmer's Fill 'n' Finish and sandpaper to smooth the reduction out. It took several passes before I got it right. While not a big deal, it threw me when Jim's normally ultra-comprehensive instructions don't mention something this major. I selected an A8-3 for my first flight, using the engine hook to retain it. I rigged up a 12" parachute with no spill hole, loaded my dog barf, and hooked her up. Flight was straight and true to around 150', she just hung in the air (like the entry to a tail slide), and then the chute popped. It was very cool. Wind was very low, so I'm not sure how it would fly in windy conditions with the big cross-section of the shroud. The descent looked OK, but one of my tips popped off on landing. Probably a weak glue joint, but next time I will move up to a larger chute. 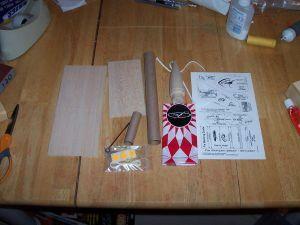 This rocket is very challenging to build and should not be attempted by a beginner. With the exception of the launch lug, this was an awesome kit. The flight was very good. I look forward to putting this up on a more appropriate engine.